Great vulnerability is often part and parcel of great artistry. The songs that last decades and weave themselves into the fabric of listeners‘ lives are usually the ones in which an artist lays her soul bare for the world to hear. 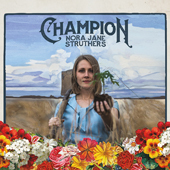 Nora Jane Struthers‚ new album Champion is built on these kinds of songs. The 13-song collection is the follow-up to 2015’s Wake, which earned Struthers acclaim from major outlets like NPR Music, Rolling Stone Country, and „Fresh Air.“ Struthers wrote and recorded the album with her longtime road band the Party Line, and the chemistry between her and the other players is palpable. The album, produced by Neilson Hubbard in Nashville, is full to the brim with stellar musicianship, unexpected arrangements that blur the lines between folk, roots, and rock, and an audible sense that everyone in the studio is having a damn good time. That tune is one of only two co-writes on the album, as Champion is, through and through, a showcase of Struthers‘ voice and preternatural gift for storytelling. Coupled with a more deeply realized sense of vulnerability, that narrative tendency makes for a collection of stories that should resonate long after the last notes of the last track end. Kommentare deaktiviert für Welcome to the Blue Rose family: NORA JANE STRUTHERS! Herzlich willkommen in der Blue Rose-Familie: NORA JANE STRUTHERS!